Peugeot has revamped its popular Peugeot 2008 GT Line SUV with more equipment and a striking new front-end design. We’ve been to Gloucestershire to test it out on and off the road. The focus really is on design, with the divisive face of the outgoing 2008 replaced by a far more distinctive and aggressive front grill. It’s a change that really gives the Peugeot 2008 GT Line SUV a better image, and suddenly makes the last model look a little bit old hat. There is of course more to the new Peugeot 2008 GT Line SUV than just the new face, so let’s get stuck into a massive review of the car, including pricing, specifications, and how it rates against its rivals. Peugeot quite rightly focuses on the ‘sensible’ in the majority of its cars, with only the ‘GTI’ cars really showing much in the way of performance. 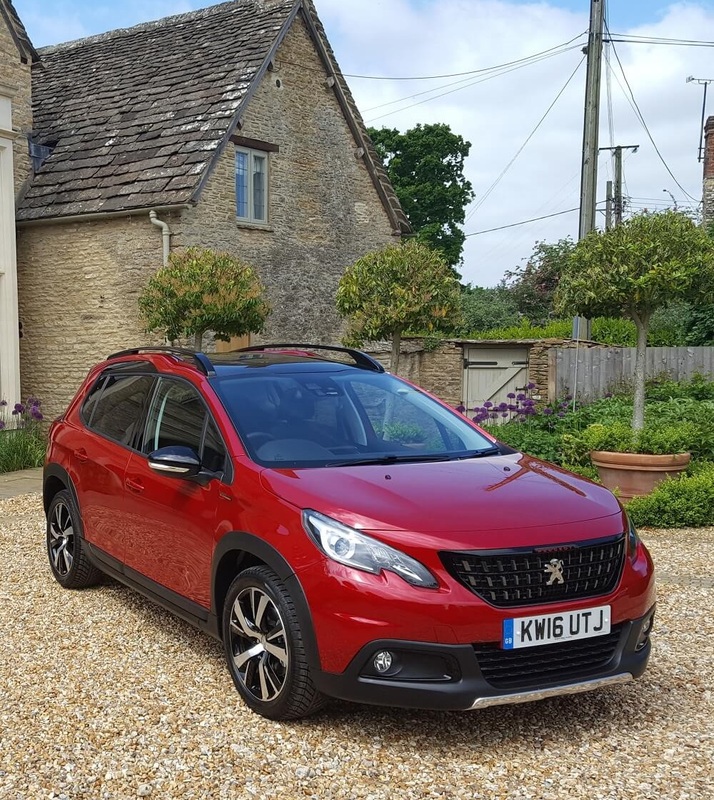 So, while the engines in the Peugeot 2008 are flat and lacking in ‘oomph’, they aren’t bad at all for what they need to do on a daily basis – they just aren’t all that enjoyable. There’s an array of engines on offer in the Peugeot 2008 but we’d stick with the lesser powered 1.6-litre ‘Blue HDi’ diesel unit that puts out just over 100PS. It pulls the weight of the car well and has a perfectly acceptable amount of power for the everyday life this car should lead. Zero to 62mph is done in 12.5s and the top speed is 112mph. Peugeot has a strong history of producing decent diesel engines, and this one is another good effort. A quoted 76mpg is strong, and a low CO2 level of just 97g/km means road tax is free. Out on the road the new Peugeot 2008 GT Line SUV 2008 settles into a rhythm rather well, absorbing faults found in the road surface and offering a decent amount of grip in corners. It’s never going to excite anybody and it can be overwhelmed when taking a corner too quickly, but it is comfortable and safe – and that’s all that cars in this segment really need to do. The new Peugeot 2008 GT Line SUV surprised us a little by being able to handle itself in some mild off-road conditions. A key part of this is the ‘grip control’ system, a mode selector that tells the wheels how to behave depending on the surface – normal, snow, mud, sand, or ESP (Electronic Stability Program) totally off. Switching to the correct mode makes the car behave in a way beneficial to the relevant condition, and you can feel it working. We like having this option, but we found we could escape the obstacles Peugeot laid out for us in just about any of those modes anyway. Peugeot has really gone all-out on the ‘i-cockpit’ interior design and the Peugeot 2008 GT Line SUV features the latest version of this interior philosophy. The steering wheel sits lower, closer to your lap and the dials are mounted higher, theoretically meaning you shouldn’t have to move your eyes far away from the road. It isn’t necessarily to everybody’s taste and taller drivers will find they might be knocking their knees on the manual gear lever in the Peugeot 2008 GT Line SUV model when in fifth gear. It is possible to knock the key in the ignition also, which is far from ideal. Despite the issues with taller drivers, Peugeot is at least trying to offer a fresh and modern take on interior design and, overall, it’s quite appealing aesthetically. It certainly stands out – much like the new exterior image. The quality of the materials used inside isn’t fantastic but everything feels well screwed together, though there are some doubts as to whether some of the plastics inside will age or stand-up to punishment that well. Our Peugeot 2008 GT Line SUV test car comes equipped with some nice touches: a fancy exterior grill highlighted with red Peugeot lettering and a red stripe on the seat belts are a nice touch – but, again, not spectacular. The level of equipment you get depends on what trim line you opt for. 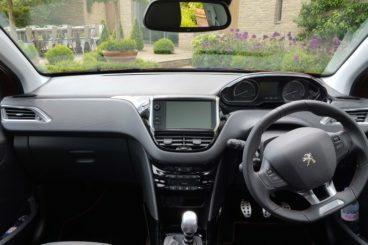 Entry level ‘Access’ trim is very spartan and you don’t even get DAB radio or the colour touchscreen system – surely a must for all new cars. The top level Peugeot 2008 GT Line trim we tested aims to give a sportier look without a sportier ride. As well as the upgraded styling the Peugeot 2008 GT Line SUV gets satellite navigation, a reversing camera and the panoramic sunroof as standard. But aside from this and the styling pack it doesn’t have much more than the trim level just below – ‘Allure’. 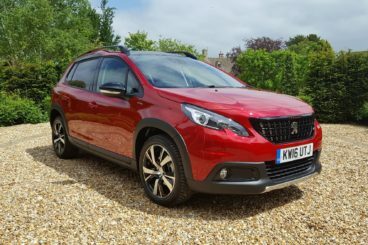 Allure represents possibly the best value trim level in the Peugeot 2008, and it is open to debate whether or not the Peugeot 2008 GT Line trim is worth the extra money. At the end of the day, it’ll most likely come down to personal preference on the styling side of things, but the Allure level has just about everything you need in terms of equipment – and comes with the useful ‘grip control’ function. Interestingly, there’s no option for lumbar support in the Peugeot 2008 GT Line SUV- and that’s something the seats really could do with having. Prices start from just £13,615 for the new 2008, but our Peugeot 2008 GT Line SUV car, as tested, started from a few pound notes shy of £20,000. The same car but in ‘Allure’ trim starts at £18,865, so a small saving can be made here. Private buyers will take to Peugeot’s ‘Just add fuel’ system of purchasing a new car, which gives buyers three years’ car insurance, a three-year warranty, three years free servicing, three years of car tax, and three years of roadside assistance. This system works on a Personal Contract Purchase (‘PCP’) method of purchasing, which is now the most common way that private buyers acquire new cars. It will come down to how much deposit you have and what your annual mileage will be, but at the time of writing this article, Peugeot is willing to do some deals and is widely touting £500 free towards your deposit. Business users should seek to lease the Peugeot 2008 GT Line SUV on a Contract Hire and, depending on your mileage, you should be able to find a good spec Peugeot 2008 for under £250 a month. The outgoing Peugeot 2008 didn’t really look the part, but thanks to its new face it now looks rather stylish and the sporty edge that the Peugeot 2008 GT Line SUV trim gives it is really well judged. First impressions are always important, and now the 2008 finally has a little bit of a swagger about it. The modern design of the ‘i-cockpit’ will certainly impress a few in particular. All of the engines on offer are really efficient, even if they don’t move you all that much. Turns out it’s pretty hard to have fun in a Peugeot 2008 GT Line SUV, but at least you won’t be visiting the fuel pumps all that often. Over 70mpg in an SUV is impressive, it has to be said. It can be a bit of a worry for people looking at SUVs for the first time, but most modern SUVs are just as simple to drive as a hatchback – the Peugeot 2008 GT Line SUV is no different. There’s no weight to the steering and it is really easy to park – even without the assistance gadgets – and it’s also got great visibility. While the modern layout of Peugeot’s ‘i-cockpit’ will attract people due to the design, it isn’t the best for taller drivers, particularly those with long legs. Peugeot’s philosophy is that by mounting the steering wheel lower, the driver feels less fatigued over long distances. We’d rather our arms ached from holding the wheel than our knees ache from knocking the steering column though. The Peugeot 2008 GT Line SUV looks great, but it’s questionable as to whether it represents good value. ‘GT Line’ is mostly just a styling pack with a reversing camera, sunroof, and sat nav thrown in, and it may be better to opt for the ‘Allure’ level and select options wisely. Perhaps it’s a little harsh, but the lack of a more powerful engine and the general absence of feel in the steering means that the new Peugeot 2008 GT Line SUV isn’t all that fun to drive – even if it is quite comfy. Peugeot has proven it can make fun cars, so why not inject just a little bit into this one? SUVs are a highly competitive area of the auto market and the Peugeot 2008 GT Line SUV has some very talented opponents to challenge – two of them being Nissan’s Juke and Skoda’s Yeti. All are great machines, but does the new Peugeot 2008 GT Line SUV have enough about it to beat these cars? The Nissan Juke has been a huge success for the Japanese auto firm, it’s nearly impossible to take a drive without seeing one on the road now. It’s easy to see why: it comes with a decent selection of engines and is more spacious than it looks, but it’s not without flaws either. The boot space is ridiculously tiny; it isn’t the best in the corners, and it doesn’t really provide much comfort for its occupants. So why on earth is it so popular? Well, it’s distinctive and provides an elevated driving position that so many buyers seem to seek out now, and it rode the crest of a wave in terms of the SUV craze. The Juke was there on offer as a compact SUV ahead of the competition, and that, combined with these other factors, made it a big success. It isn’t a bad car, but it isn’t particularly good either. It just happens to be what people are looking for. The Peugeot 2008 GT Line SUV has many advantages over the Nissan Juke, being more practical, more comfortable and coming with a better selection of engines. It also has the styling edge on the ageing Nissan Juke, and so really you have to say the Peugeot 2008 GT Line SUV is the better car now. 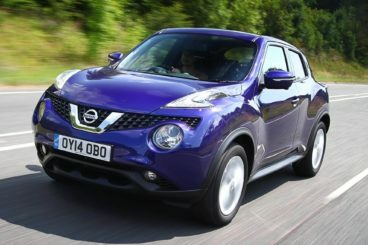 However, the Juke has one more trick up its sleeve. For those who fancy something a little spicier, there’s a Nissan Juke available with over 200PS – the Nissan Juke Nismo RS. It’s fast, stiff and quite uncomfortable, but it comes with unmistakeable Nismo charm and is really good fun to drive, offering something the Peugeot 2008 GT Line SUV just can’t. If the battle with the Nissan Juke went in favour of the new Peugeot 2008 GT Line SUV, the battle with the Skoda Yeti will be a much tighter affair. 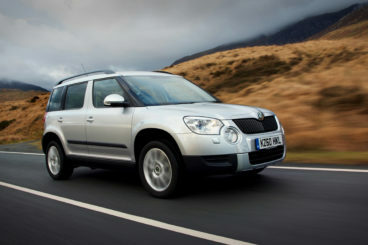 Since its introduction, the Skoda Yeti has established a cult following amongst the British public and it has been a big sales success. Czech automaker, Skoda, has really managed to hit the nail on the head with the Yeti. It’s an incredibly versatile car that has a really charming ‘function over form’ character to it, in many ways totally the opposite to the Nissan Juke. In the Yeti, the rear seats can be completely removed from the car, allowing for unrivalled practicality at this level. The Skoda Yeti is also fairly good fun on the road, coming with a fine selection of the Volkswagen Group’s powerful diesel engines and the option of four-wheel drive. There are also strong petrol engines available for those who do fewer miles. There is one drawback to the driving experience though, the ride isn’t as comfortable as it could be and the Peugeot 2008 GT Line SUV certainly beats it for comfort. In some ways this is a difficult one to call. When put up against the Nissan Juke, the Peugeot 2008 GT Line SUV looks like it moves the game much further along – being more comfortable, more practical, and more stylish. However, when it goes face to face with the Skoda Yeti, you realise it hasn’t really done all that much to move the game along at all. There’s also a frustrating lack of more powerful engine options. Sure, it’s not the most crucial thing in this market, but when the rivals it is facing have engines that, in some cases, have up to 50PS more clout you can’t help but feel a little short-changed. Let’s not forget the Yeti can also come with four-wheel drive, which can be useful in more challenging conditions. At least the Peugeot 2008 GT Line SUV has won on the comfort front, and comfort has often been found wanting in its rivals. The lack of lumbar support is frustrating and the ‘i-cockpit’ won’t be universally admired, but it looks sharp and is a welcome upgrade on the outgoing model. You just get the feeling though that the battle will be decided by who offers the better deals to the customers, and not by personal taste.